Dogs can suffer from overheating in hot weather especially long or thick coated breeds. 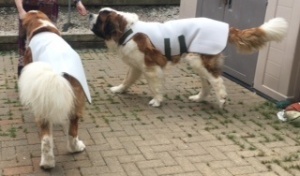 Overheating can be extremely dangerous for dogs and a cool coat can help keep your dogs body temperature down. The Big Dog World cool coat is a fantastic quality coat for large dogs. Many cool coats on the market become rock solid when they dry but the Big Dog World cool coat is made from a high-tech mesh type material which always stays soft and pliable. 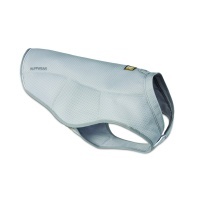 Your dog's skin stays cool but dry underneath the coat. Simply soak the coat in cold water and wring it out before putting it on your dog. It can then be rewetted as necessary. The neck stap and two underbelly straps ensure an excellent fit and the coat is fully machine washable. 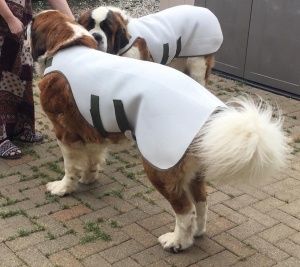 The cool coat is available in sizes to 90cm length for large and giant breeds. To find the correct size measure your dog along the length of the back (from the collar to the base of the tail). We've had ours for a couple of years now. We did buy a couple of Ruffwear ones this year, but have yet to use them as the BDW ones are better because they are easier to get on a wriggling dog! Will be purchasing two more for our new additions next year. I ordered a cool coat for my Great Dane Obi. I always find them hard to get as he is extra large even for a Dane. I ordered the biggest one and it fits perfectly and arrived very promptly even though I live in Ireland. I have already recommended the company to other Great Dane owners. A 5 star company in my view. 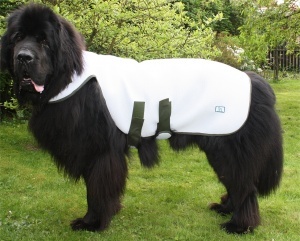 Great cool coat for a Newfie. The coat arrived promptly & has been very useful in hot weather. The Velcro fastening means it fits well. It is easy to wet & keeps our Newfie cool in the heat. Even when it has dried off he still stays cool & comfortable underneath.